Standard and custom size solid wood restaurant dining table tops in select hardwoods, customized for your seating plan. Browse our standard size or custom sized solid wood restaurant table tops. Our tops are handcrafted in select hardwoods for durable, long lasting tops that provide you with long term value. Standard and custom size and thickness finished top items are finely crafted in our production shop our heirloom quality from kiln dried hardwoods. 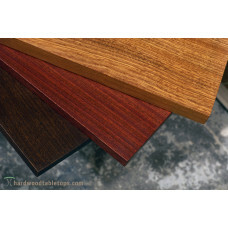 Hardwood choices include Cherry, Hard Maple, Ash, Sapele, African Mahogany and Black Walnut. Other domestic and exotic hardwoods are available, please inquire. Our standard quick ship restaurant tops are finished in our low VOC polyurethane finish or offered unfinished and finish sanded. Our heirloom quality finish is low maintenance, durable and resembles a hand-rubbed finish that allows the texture of the grain to remain apparent. Our finish, while being very durable, is also easy to renew which represents increased value to restaurant, dining, hospitality and commercial establishments. Our quick shipping restaurant tops will ship within 15 working days of order date. We craft square, round, rectangular and custom shapes as well, please contact us for a custom quote. If you want assistance or would like to talk about your table top options, feel free to call us at 224-801-1969 and we will be happy to assist you. Sapele table tops | Configure your solid wood tops, 1.25" thick in custom sizes, stains and finishes..
Why Choose Hardwood Table Tops for Your Custom Made Restaurant Table Tops? 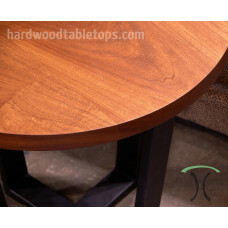 Our quality solid wood restaurant table tops provide lasting value and will impress your guests. Durable Heirloom Quality: Our solid hardwood table tops are made with select kiln dried wide plank lumber. Every top is treated as a showpiece from board selection through finishing. Custom Made for Your Seating Plan: You can choose your size and select your hardwood with our online table configurator. 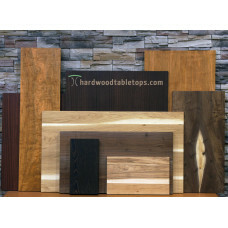 Select the thickness you desire from standard 1.25 inches to thick slab 2.5" table tops! Table Tops are Handcrafted One at a Time: Though we operate a production wood-shop, each table top is individually crafted to your specifications to heirloom quality standards. This process takes time and we do not take shortcuts since both eye appeal and long term durability are our hard and fast rules. Our industrial equipment, shop efficiency and craftsperson knowledge allow us to achieve exceptional lead times. Lead times vary by product type from our quick ship restaurant tops with 15 working day lead times to our standard 5-6 week lead times for live edge Black Walnut and our large thick slab dining and conference table tops. Call 224-801-1969 for more info. 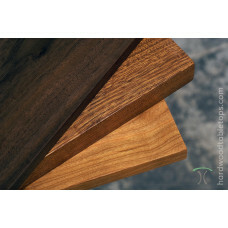 Value for Your Money: Custom made hardwood tops are an investment and our quality standards assure that you realize value initially and over time. Whether you order a single table tor or dozens, our premium quality provides for lasting value. *We currently ship our table tops to the Continental U.S. only. Tops larger than those that conform to standard-size FedEx ground shipping requirements will be shipped via freight - logistic partner. Shipping time vary by location and by carrier. Pick up is available at our East Dundee, IL furniture and table showroom and we also deliver to the greater Chicago area.